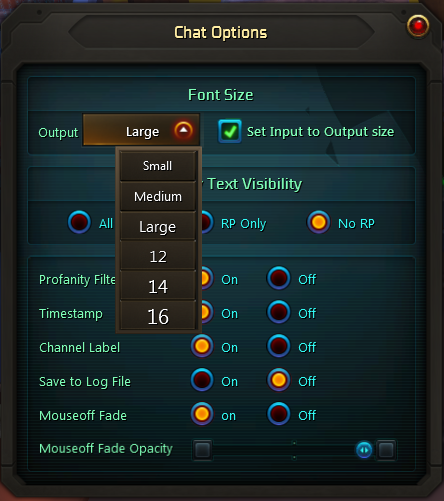 ChatFontSize is a simple addon that allows you to choose a few additional sizes for the chat window font. It also allows you to use the default provided "small", "medium", and "large" font sizes as well. Set font to 12, 14, or 16 point font, in addition to "small", "medium", or "large" as provided by the default UI. Replaces default chat options for font size with a flyout window for choosing the size you want. Use the /fontsize command to set the font size directly from the chat input bar. Sets both the chat font size, and the RP font size (see caveats below for the "alien" font size). Experimental support for setting the input font size to the same as the output font size. The "alien" font (used to hide profanity) only comes in three sizes. So if you have your profanity filter turned on, the font used to represent it may be smaller than the regular and RP fonts. Almost certainly will not play well with addons that replace the Carbine ChatLog addon. Saves font size data per character, not per account. From the options UI (press Escape), click Chat and open the font size dropdown (see images).